Major scientific awards in 2016 showed the important role of animal models. The Nobel Prize for Physiology or Medicine celebrated Dr Yoshinori Ohsumi’s work on yeast and mice, which helped him uncover the “mechanisms of autophagy”. A few weeks earlier the Lasker Awards highlighted the work in numerous animal models including frogs, rabbits and primates, in the discovery of how cells sense and respond to changes in oxygen levels, and their work in understanding and treating Hepatitis C. Check back later this year to see what the 2017 Nobels and Laskers show about the need for animal models. 2016 showed a number of animal research breakthroughs (a few of which Speaking of Research even wrote articles about). In February studies showed that the HPV vaccine, developed using rabbits, mice and primates, had helped reduce infections of HPV (which can cause cervical cancer) by over 60%. April produced news about how optogenetics could bring about a number of drug-free treatments. This news was based on studies in mice and fish. In August, research on sheep by Australian and American researchers helped to create a new device for recording electrical signals inside the brain – hopefully reducing the need for invasive surgery in some situations. Work on lambs by Dr Robert Tranquillo, at the University of Minnesota, could help create synthetic blood vessels and heart valves that grow as the patient does. In October, Dr Stuart Baker, at Newcastle University, described his work with humans and primates to drive forward a new technology aimed at helping stroke patients recover (see also what he wrote about the importance of animal research). Research on primates also came into the spotlight during 2016, causing many scientists to stand together in defence of their use. In February, Speaking of Research wrote a letter to the Australian Senate Committee on Environmental Protection about a proposed bill to ban the import of primates for biomedical research. After the New York Times published an article by animal research critic, Dr John Gluck, 90 scientists signed onto a response about the moral imperative for responsible animal research. 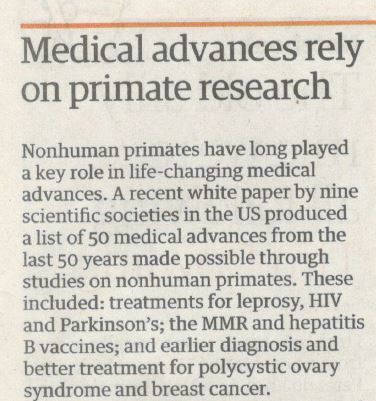 Nine scientific organisations produced a white paper highlighting the importance of non-human primates in research. Soon after, hundreds of primate researchers and neuroscientists, including Nobel Prize Laureates and Lasker Award winners signed a letter defending the important role of primates to medical science. 2016 has seen eighteen countries provide their 2015 annual animal statistics (including the US); we intend to keep these statistics updated throughout 2016. These statistics were just one example of transparency. The University of Leicester showed the power of positive engagement with the media when they invited a journalist and cameraman from the largest newspaper in the UK. 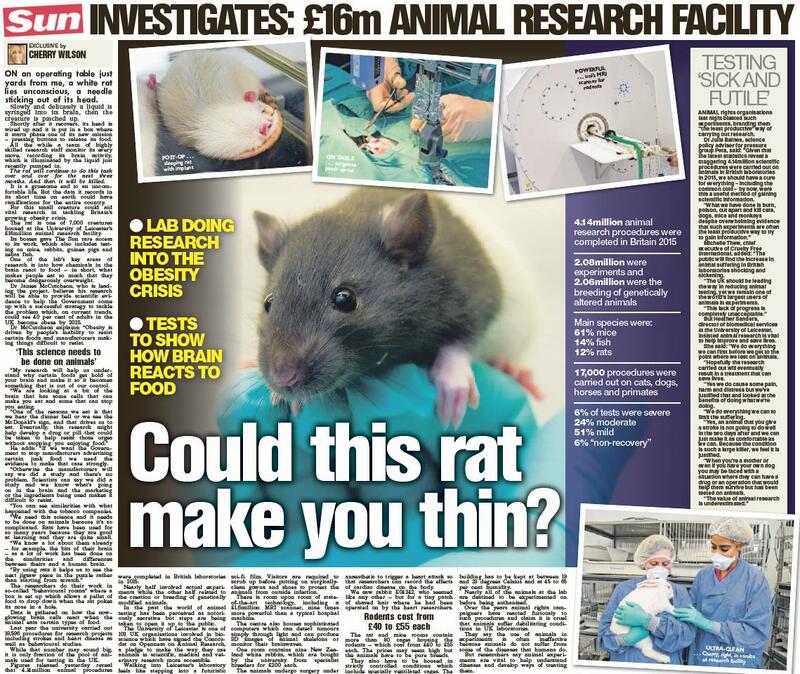 The resulting article was a fantastic piece about animal research. Other good examples of openness included a new website by Novo Nordisk and the University of Edinburgh, Biomedical Research Awareness Day, and the “Broader Impacts” programme at the University of Wisconsin-https://speakingofresearch.com/2016/01/28/background-briefing-on-animal-research-in-germany/Madison. Our list of animal research institutions’ animal research position statements reached 287, having passed 200 in February. Speaking of debunking nonsense, February marked the 10 year anniversary of the Pro-Test movement which challenged the misinformation of animal rights groups in Oxford and defended the building of the new Oxford Biomedical Facility. Our request for new committee members has brought a large amount of interest, so expect some new and interesting perspectives. The first of these, by new committee member Christine Archer, explains how she became a veterinary technician working with aquatic animals and reptiles. We are still interested in hearing from potential new members, particularly those who work in science communications at research institutions. We also continued to have guest posts as part of our Speaking of Your Research (SYR) series of posts. If you are a researcher who has a story to tell about your research, please get in touch. Speaking of Research thank you for your enormous support in 2016 and hope you will continue to support us in 2017.